In the 1980s, Penny Livingston Stark and James Stark began developing their 3/4 acre home in Point Reyes, California, as permaculture oasis. They took what was once an open space with a few trees and transformed it into a living permaculture classroom, with features like a grey water koi pond that processes laundry and bath water, a cob library with roof catchment and an outdoor bread oven and attached bench, a vaulted strawbale cottage, and a permaculture food forest garden with fruit, nuts, herbs, berries, vegetables, bamboo and more. From their work at this site, the Permaculture Institute of Northern California (PINC) emerged and Penny and James began teaching courses in Permaculture and other sustainable, earth-based practices. During this time, Penny and James also developed the Skywater Center in Trinity County as an additional site for permaculture trainings. Skywater is a large-scale restoration project that has hosted workshops on permaculture and wilderness awareness, forest management, erosion control methods and keyline patterning. PINC also partnered with the Institute of Noetic Sciences (IONS) , where Penny, James, and many of their students have developed a productive vegetable and perennial fruit garden, an artfully sculpted cob greenhouse, a series of flow forms for cleaning pond water, rainwater harvesting system, and much more. 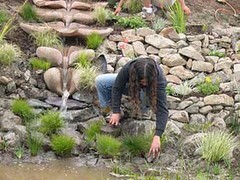 I n 2003, Penny and James were offered the unique opportunity to apply their design skills and expertise to develop the Commonweal Garden - a beautiful 17 acre site in Bolinas, California - into a large scale living permaculture classroom and demonstration center for regenerative design. With this opportunity to expand their work and vision, the Permaculture Institute of Northern California became the Regenerative Design Institute (RDI), a 501(c)3 non-profit organization dedicated to education and training skilled leaders in regenerative design. RDI works in partnership with Commonweal, a health and environmental research institute and retreat center. 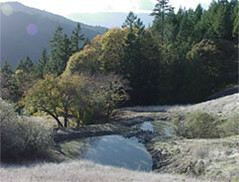 The Permaculture Institute of Northern California still exists as the original home-scale permaculture site that Penny and James developed in Pt. Reyes. It is now a private residence, where several of their graduated students live and care for the permaculture oasis. Occasional tours and seasonal volunteer days continue to take place at this site. The Regenerative Design Institute at Commonweal Garden has grown strong roots, and hosts hundreds of visitors and course participants every year. RDI now offers a wide array of courses in permaculture, nature awareness, leadership, wildcrafting and more. Our capstone course, the Regenerative Design and Nature Awareness (RDNA) Program, is a unique 9-month intensive that combines permaculture, nature awareness, community leadership, and mentoring skills. In addition, custom youth programs and private tours are also offered. By providing skilled designers, farmers, trades-people, educators, facilitators and community leaders, the goal of RDI is to spread the awareness that we can design and build development models worldwide that address human needs while simultaneously regenerating the surrounding environment to become more fertile and diverse in the process.